A Catholic Franciscan church was built in 1924 by donations from many nations (hence one of its names). It is one of the most magnificent churches, located on the east bank of Kidron Valley in the foothills of the Mount of Olives. The site was called Gethsemane, which means "olive press" (from Gat Shemanim). 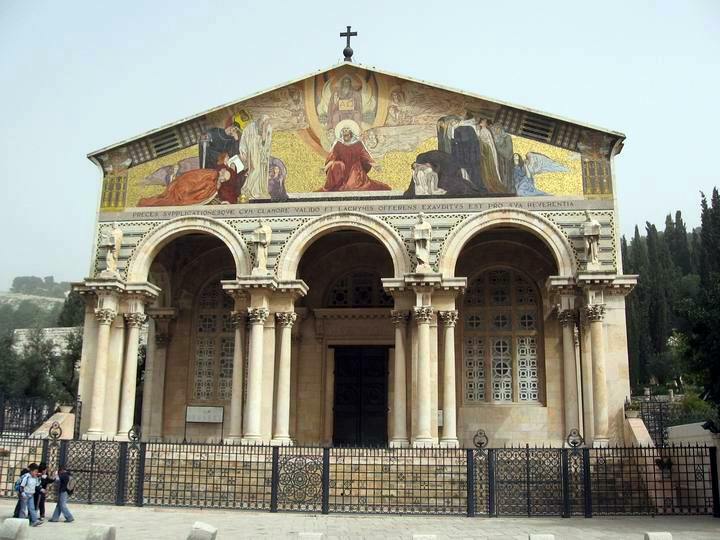 The front of the church, facing the Temple Mount, is covered by a large mosaic picture. The interior is also decorated by magnificent mosaics. In its garden is an ancient olive grove, believed to be descended from the original olive trees of the times of Jesus. According to the New Testament, the Garden of Gethsemane was the site where Jesus prayed his last prayer, was betrayed by Judas, arrested by the Roman soldiers and imprisoned. John 18: 1-12:When Jesus had spoken these words, he went forth with his disciples over the brook Cedron, where was a garden, into the which he entered, and his disciples. And Judas also, which betrayed him, knew the place: for Jesus ofttimes resorted thither with his disciples. Judas then, having received a band of men and officers from the chief priests and Pharisees, cometh thither with lanterns and torches and weapons. Jesus therefore, knowing all things that should come upon him, went forth, and said unto them, Whom seek ye? They answered him, Jesus of Nazareth. Jesus saith unto them, I am he. And Judas also, which betrayed him, stood with them. As soon then as he had said unto them, I am he, they went backward, and fell to the ground. Then asked he them again, Whom seek ye? And they said, Jesus of Nazareth. Jesus answered, I have told you that I am he: if therefore ye seek me, let these go their way: That the saying might be fulfilled, which he spake, Of them which thou gavest me have I lost none. Jesus prays in the Garden of Gethsemane with his disciples; he was captured after Judas betrayed him.